Letters have always had a mixed press. It can't have been very encouraging or entertaining to receive the instruction Kill the Messenger, for example. Much later, writer Paul Scott warned that a letter never smiles, while gloomy Kafka asserted that letter-writing produces 'a terrible disintegration of souls'. But for decades I agreed with Cyril Connolly, who wrote that the essence of country life was waiting for the post. Whereas the first email was sent a mere 40 years ago, letters have always been with us. Well, nearly always. And were associated with power and control in times when few people were literate. Britain's Royal Mail can trace its existence back to 1516. In 1603, James I of England, who also happened to be James VI of Scotland, established a postal service between his court in London and Edinburgh, in an attempt to retain control of the Scottish Privy Council. The US Postal Service owes its existence to Benjamin Franklin and the infant revolutionary movement; the Turks had scarcely been defeated in 1828 before the nascent Greek state set up the body that would become Hellenic Post, with which institution I (as an Aussie living in Greece) have had a love-hate relationship lasting 30 years. Australia Post probably had the most practical start of all, when in 1809 ex-convict Isaac Nichols was given the job of boarding ships, collecting the mail, and then distributing it from his home in George Street: thus the pandemonium of the general public rushing newly-arrived ships was avoided. My children were not surprised to learn their parents met at the Melbourne Mail Exchange, where we swore on specially supplied Bibles that we would do our best to expedite Her Majesty's mail. We learned the post offices of Victoria and their districts: I can still tell you that Drik Drik was in SW 9 (Country). Our work consisted of poking envelopes in the relevant slots, after which said letters were borne away on conveyor belts to waiting bags. In Australian country townships the post office was a community centre and meeting place comparable with church. In rural Greece nothing could supplant the church, but my local post office was still vital: pension day was a regular nightmare, with little mountain men wanting their cheques immediately, if not sooner, and jostling, pummelling and yelling to great effect. There was often a donkey or two tethered outside, and postman Panayioti was once mightily affronted when a chook made its way inside. The only public phone was in a corner booth, so there I occasionally stood, talking at vast expense to my parents, with an audience gazing through the glass and wondering at ta xenna, the foreign language. Sending a parcel was another ordeal, as the contents of the box had to be inspected, and then the receptacle itself had to be sewn into a cloth cover supplied by the sender: the village yiayathes were often critical of my needlework. Unsurprisingly. And it was a dark day when I had no letters from Australia. How times and practices have changed. Last year a Melburnian friend told me she was about to post some letters in the box near her house when a car drew up: a man leaned out and asked if he could watch, he'd never seen anyone post a letter before. 'How many?' he asked. When she said, 'Six,' he drove away, shaking his head. The switch to email has meant a huge cultural shift. Email has affected our modes of expression and use of language; it has meant different notions of records and permanence. For how long will biographers be able to ask: Have you got the letters? And I cannot imagine that lovers print out their emails and tie them in blue-ribboned bundles. Some American states have even given up the teaching of handwriting in schools. Me, I'm still waiting for the post, but these days I eye my inbox in the hope I have not been totally abandoned. Thank you Gillian. I work in a secondary college where there is a strong emphasis on "cyber safety" and the pitfalls of online "friends." Such a different world from my teen world of the sixties when all my distant friends wrote letters. What a joy it was to receive letters from Scotland, Ireland, Japan, France and Fiji. Pen-friends brought a richness to my life in rural Victoria which was invaluable. Oh and the art of letter writing - itself a skill of beauty! The conventions I adhered to were the same as those of my pen-friends. Now we all worry about our "grands" and their dubious online relationships. My mother made me write thank-you letters to distant grand-parents for birthday and Christmas gifts. I remember putting in all my school exam results to pad it out - signing off as "Your loving grand-son" already learning formulaic niceties. Then came pen-friends: Rhode Island, Japan, the UK, PNG...and to my mother as I endured early separation from age 16 away at university. 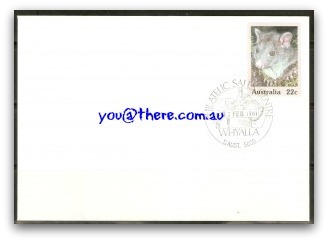 Travels and living in Spain and Germany saw my writing become tiny as it filed hundreds of postcards sent back to Australia - and other distant parts. During the early years of my time in Japan the friends I most cherished were those who cut out the political and literary pages of week-end newspapers and enclosed them along with their letters describing the social occasions of family and friends! Just last week a real letter - from Richard MARLES MHR came into my letterbox - hand-written! A "red-letter day"! But yes - e-mail these days - over the past 15 years! A good article containing lots of nostalgic memories. Living in country Victoria as a child I have memories of the protocol of having to write laborious 'thank you' letters to my Aunts after Christmas and birthdays. Like you Gillian I also worked as a Temp in the Australian Post Office, and in the late 1960s when living in Alice Springs I well remember, with bible in hand being deputized by the local Post Master to help sort Her Majesty's Mail. Also, what a process it was then to phone my parents back in Victoria when I preferred to talk rather than write - being patched through to exchanges like Oodnadatta, and the other endless line of exchange workers along the way. They sometimes seemed to be sleeping, with bells ringing to wake them up - especially at nights, while I waited patiently listening to it all in my ear piece. 'Making a trunkline call' was the modern term then for using this marvellous technology. It was quicker than camels and almost as romantic! Thanks Gillian. I, too learned to write letters when quite young. My sister and I used to argue about for whom letters addressed Miss J. Dickson were intended as we both had the initial J. My first job was on the local telephone exchange at Kalorama in the Dandenongs. That has changed considerably too. Wonderful trip down memory lane. Still have letters my Grandfather wrote to me as well as collections of letters and post cards from family and friends telling of exciting events in their lives, mundane news, and just 'keeping in touch' comments. Haven't kept my emails though so I cant go back and reread all that! I appreciate the article, but I'm a little saddened by the responses that seem, almost certainly inadvertently, to keep the idea of the post as a fond memory. I myself make a deliberate choice to write letters to my remember posting nostalgically: if we believe in it, we have to keep the Post alive by deliberately writing and posting letters. If we don't use it, we'll lose it. Letter writing never came easily to me, worst of all were the many thank-you letters that had to follow relatives' birthday postal orders - usually an English 10 shillings (in those days, 12/6 in our money). Since my exam results were never that much to write home (or anywhere else) about, I'd offer details of the weather making it sound like a detailed Bureau of Meteorology report for Southern Australia. Often, after a morning's scratching away and many failed drafts (rejected by my mother), I felt that I'd have been better off if I'd not got the money in the first place. Posting a letter is one of the tasks my wife and I do with our grandchildren when we have them for the day. The three oldest ones have all been into the post office with us lurking in the back ground and asked the lady for 10 stamps. I have always said that the most important thing they get out of visits to Nana and I is that we do different things to Mum and Dad. All 4 have received post cards from us when we go away for a few days and look forward to collecting the mail during this time. Realistically it is likely that children will post letters for the simple reason that I am not posting this contribution. My Grandchildren have never seen anyone light a gaslight or seen anyone use a spitoon. They have never seen a person selling newspapers on the side of the road. There are moments that highlight the misery of Anne's condition, the slights rendered against her dignity. She awakens in a puddle of brown urine; labours excruciatingly over every syllable she speaks, but is misunderstood; howls in pain as she is showered. Her husband can do little but tend dutifully to her needs. Is it enough? Whenever I spot that lithe mottled feral cat lurking behind our pumpkins, I have to fight bipolar urges. The kitty-lover in me wants to lure it in with milk and sardines, then trap it into a co-dependent relationship. My other urge is the environmentally responsible one: to take it to the vet and have it put down.